Roosevelt’s Rough Riders had been taking fire all morning. They were pinned down, lying flat in the negligible cover of the reeds, rushes and tall grass on the lush river bank at the foot of their objective. On the hill above them, the Spanish position was just visible through the haze. From that direction came the steady crack of rifle fire, punctuated by the deeper boom of artillery. This was Cuba, July 5th, 1898. The United States Army, under the command of General Shafter, was facing an entrenched Spanish position above the road to the city of Santiago: two hills which together were known as San Juan Heights. Away on the left, the main body of troops were preparing the assault on the larger of the two hills, but the Rough Riders, along with the 3rd and 10th Cavalry regiments, were facing the smaller rise which they had called Kettle Hill. All three regiments were steadily losing men, and they were becoming restive and eager for the order to attack. 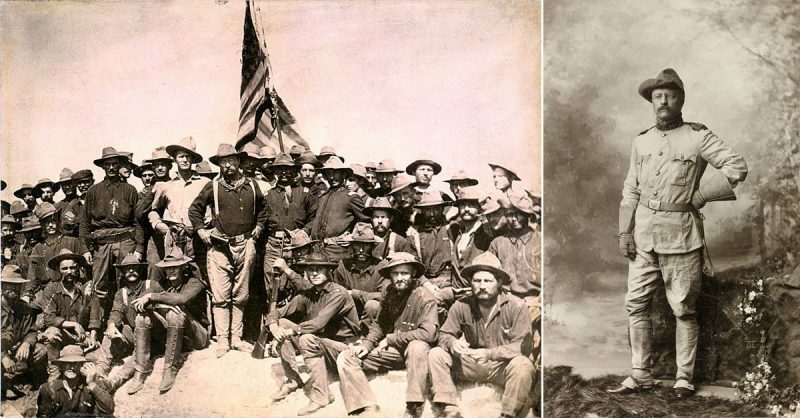 The Rough Riders were officially known as the 1st United States Volunteer Cavalry Regiment. They had been raised for the conflict in Cuba which would become known as the Spanish – American war. This was a relatively short campaign which ended with a United States victory over Spanish forces, the signing of the Treaty of Paris in December 1898, and the direct United States control of Cuba for several years. The Treaty of Paris marked the end of the Spanish empire in the Americas and the beginning of the United States’ recognition as a great world power going into the 20th Century. At the summit of Kettle Hill, from left to right, the 3rd, 1st and 10th cavalry regiments. The Rough Riders were trained to fight from horseback with rifles and small arms. They were a mixed bunch of men from all walks of life, miners and prospectors, cowboys, college athletes eager to see the world and older veterans of previous conflicts. Well armed and well equipped, they had already achieved some notoriety as a tough bunch by the time they found themselves staring up the long slope at San Juan Heights. At the start of July of 1898, the Rough Riders were under the command of Colonel Theodore Roosevelt. He had already achieved a respectable military and political career – at the start of the war of 1898 he was Assistant Secretary to the Navy, but he resigned this job to fight on the ground in Cuba. Theodore was in his fortieth year, a bespectacled man with piercing, thoughtful eyes. He cared deeply about his men and bitterly regretted the fact that, due to inadequate transportation from the States, they had been forced to leave not only their horses but a full third of their strength of men behind. 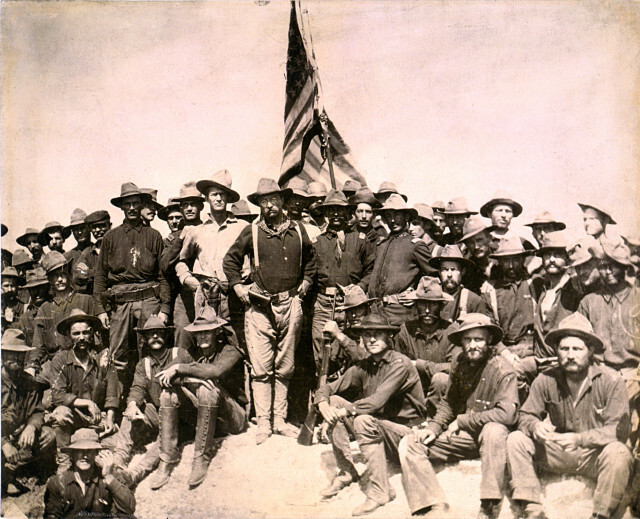 Roosevelt’s specialist Cavalry regiment was forced to fight on foot. By the time they faced Kettle Hill at San Juan Heights they were reduced to a force less than five hundred strong. 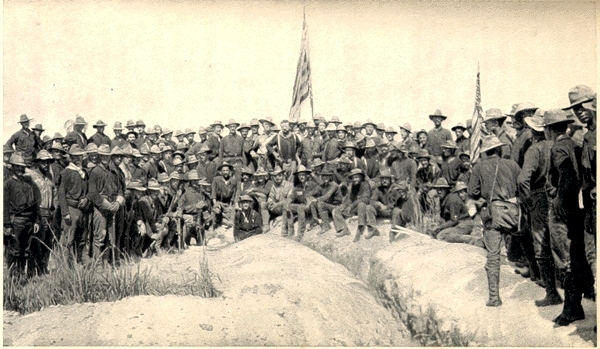 Standing with the Rough Riders were the 3rd and the 10th Cavalry Regiments, who were also obliged to fight as foot infantry in the campaign. They were in no better condition. They were also steadily losing men both to enemy fire and to the intense heat. If action was not taken soon it would no longer be possible to take the hill. Roosevelt took charge of the situation. After repeated requests, the regiments received the orders they had been waiting for, and they began a slow, creeping advance up the hill. They returned fire toward the Spanish positions, but ineffectively. Theodore could see disaster approaching. It was plain to him that the only way the hill might be taken was in a fast, full frontal assault. He was mounted on his great grey mare, Texas, and rode back to speak hurriedly with the platoon captain, whose job it was to enforce Colonel Shafter’s orders. Theodore urged for the charge. The captain hesitated. Theodore, recognising himself as the highest ranking officer nearby, took command. His horse’s hooves thundered and kicked up clods of mud and grass as he tore back toward the front of the line. He waved his hat in the air and gave a yell, and the cry was taken up by the men around him. They stood and began to run, dashing up the slope. Charge of the Rough Riders at San Juan Hill by Frederic Remington. In reality, they assaulted San Juan Heights and the portion later called Kettle Hill by the Americans. To the left, in the centre of the United States line, Lieutenant John Parker and his small group of volunteers were engaged in hauling three gleaming Gatling Guns into position. These were brand new machines, and it had taken a significant amount of work by Parker to make sure that they were included in the army which being sent to Cuba. He had overseen the entire organisation of the Gatling Gun Detachment, trained the volunteers to operate them, and personally arranged the purchase of draft animals to make sure they were in place for the battle. As he and his men hurried to finish setting up the guns, Parker saw the waves of American soldiers begin to gain speed up both hills. On Kettle hill, Theodore Roosevelt rode back and forth along the line of his charging men, yelling encouragement to them. The rifle fire from the Spanish position had become intense, and more and more men were falling. Suddenly, the air was filled with a sound like a hundred heavy hammers. It was the Gatlings. Roosevelt cried out to his men, who had faltered for a moment, thinking that the noise was that of Spanish machine guns. The cry was taken up by the Rough Riders, and by the 3rd and the 10th Cavalry. Men from all three regiments had become mixed together and charged up the hill side-by-side. The suppressing fire from the Gatling Gun battery raked back and forth across the Spanish positions on both hills. The Spanish rifle fire dwindled, replaced by screams and yells of panic. The Rough Riders gained the summit of the hill to find it almost deserted, the defenders having died or fled under the relentless fire from Parker’s battery. They engaged and quickly overcame the remaining enemy troops. On the left, on the crest of the larger hill, they saw the Spanish flag fall, replaced by the Stars and Stripes. From both hills a cheer went up, but the battle was not over yet. The Spanish regulars had reformed, and a force of roughly six hundred men were now counter-attacking the severely reduced American forces holding Kettle Hill. 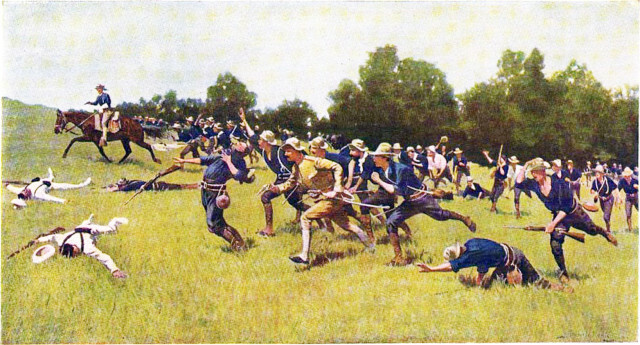 Things might have gone badly for the Rough Riders – the Spanish rifles were able to fire much faster than their American counterparts – but Parker had not been idle. When the Americans had signalled to him to cease firing he had immediately begun moving his guns toward the summit of the larger hill, and now one Gatling Gun which was in range of the Spanish counter-attack and opened fire. There was no hope for the enemy. Of 600 men who joined the counter-attack, only forty made it within rifle range of the Rough Riders. San Juan Heights had been taken.